On our visit to the town of Avilés my friend Laura took us the shop of a friend of hers. The shop is called La dentelle (you can check the website but it is still under construction: www.ladentelle.es). The shop owner, Bea, showed us the place and all the stuff that sells: patchwork, embroidery, felt, beads, books and many other things to make handcrafts. Among all these things one cought my eye especially: bobbins. I remember that I saw or read some time ago bobbin lace somewhere and I thought how difficult that must be! But now, while I was in the shop, I thought that I had the same idea about knitting, that it was something almost impossible and so difficult that I would never ever be able to learn it. Well, here I am now... knitting almost anything I want. 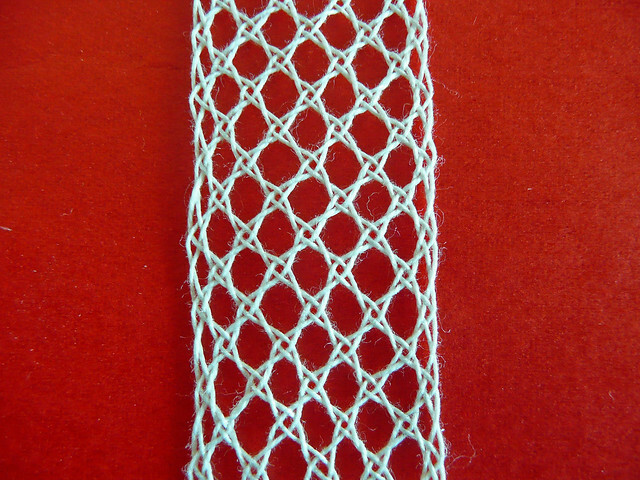 Then, why not try some bobbin lace? The worst that can happen is that it won't work so I bought a set of 50 bobbins, some thread, big pins and two books. I didn't but the pillow to work on because I she didn't have the one that I wanted to get so I decided to wait until she gets it to order it on the net. 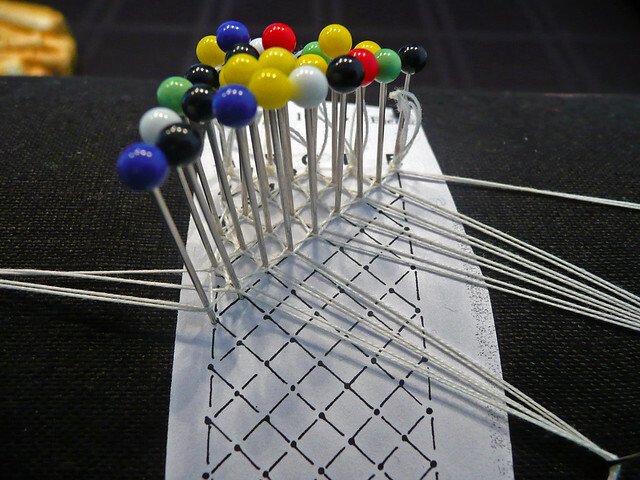 In the meantime, I started to read about bobbin lace on the internet, blogs, websites, videos in Youtube, etc. While investigating I found a really nice blog that had a little step by step tutorial to make a pillow at home. It is very simple: just some fabric, foam, sand and shoe box. Mine is almost done... I just have to make the show box look a little better but oter than that the pillow works perfectly! Bag full of sand, foam and all covered with linen. 2nd step: Prepare the pillow. Pin the pattern on it. 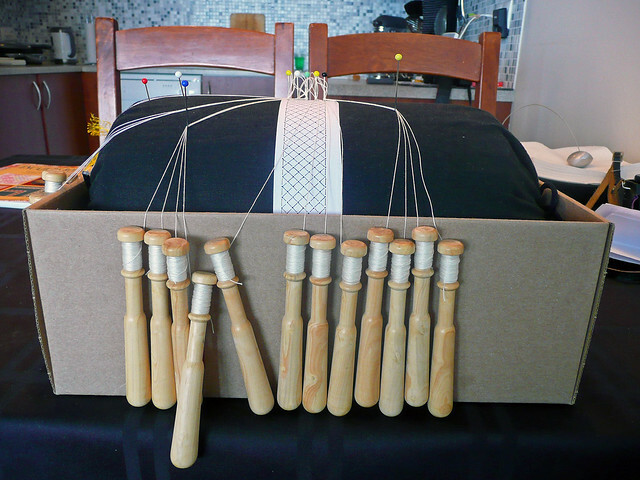 3rd step: Put the bobbins on the pillow and let the fun begin! This first excercise aimed to learn how to make the half stitch. It was so hard but again... this is just a very basic stitch. I can't stop looking at it and see how the thred shapes so perfectly... this really MAGIC! I am very happy with the result and now I am looking forward to starting with the second excercise!! 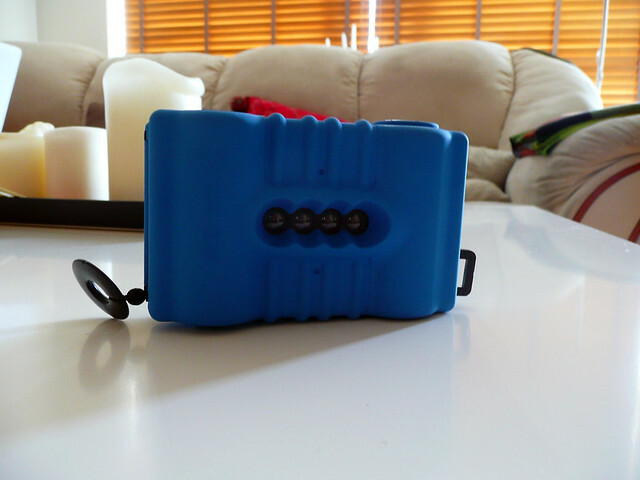 Last week I also bought a new toy: A multilens camera. It is a funny camera. It takes four panoramic pictures per frame so it is possible to catch "movement" with it. 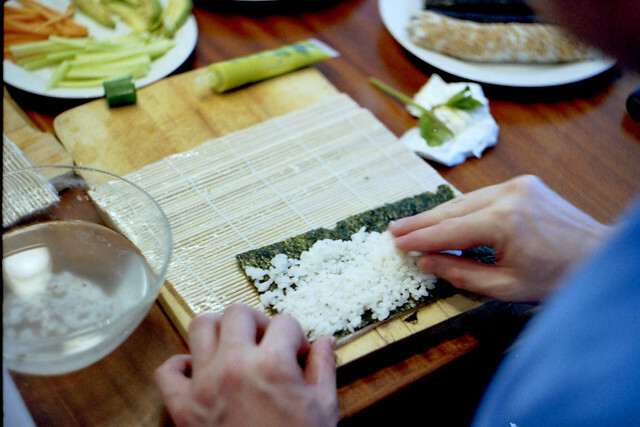 I am finishing the first film roll during the weekend... next week I'll show how it worked! i love seeing your pictures. i miss iceland, i feel homesick for it. funny isnt it? because of how i felt just before leaving! the irony! but that is how things work i think sometimes, and it is a good feeling missing it too, knowing that it is there, waiting for us when and if we are ready to come home to it. Que maravilla poder leer tu blog. Que bueno el encaje de bolillo,sos un maestro.Exitos!!! ais! el encaje de bolillos!! me encanta! los trabajos que se pueden hacer....a mí me enamoran! de seguro que te saldrán cosas hermosas! I am also enjoying your pics everyday (and I love that you are writing the names in spanish)!! Susi, qué bueno que ahora sí puedas leer mi blog :) Espero que la traducción sea buena. Lo de los bolillos... estoy recién comenzando lo que seguro será un largo camino, jeje. ¡¡Gracias por tus buenos deseos!! Hola Romi! Concuerdo totalmente contigo... el encaje de bolillos me mata también! Has probado alguna vez hacer encaje? has empezado con buen pié!!! 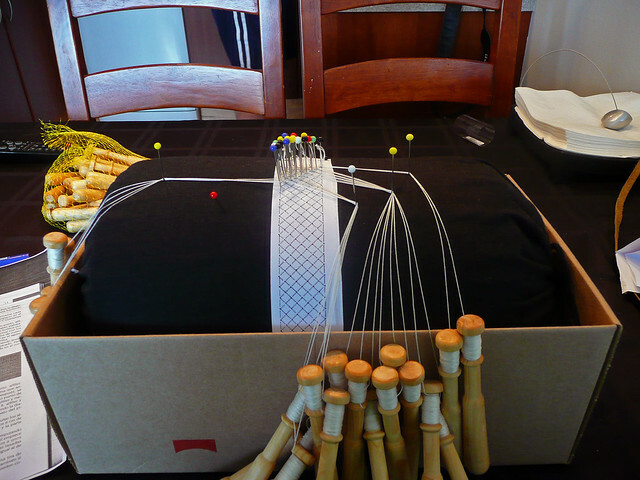 The bobbin lace looks GORGEOUS..........and time consuming. I was hungry when I began reading your post but now I am STARVING!!!!!! 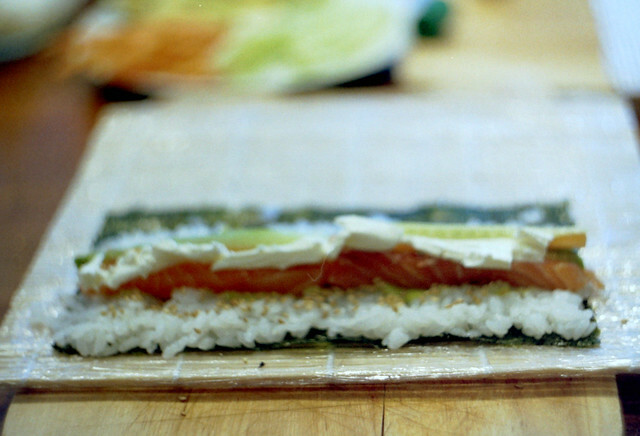 I LOVE sushi but have never made my own but really want to try now that you make it look so simple! 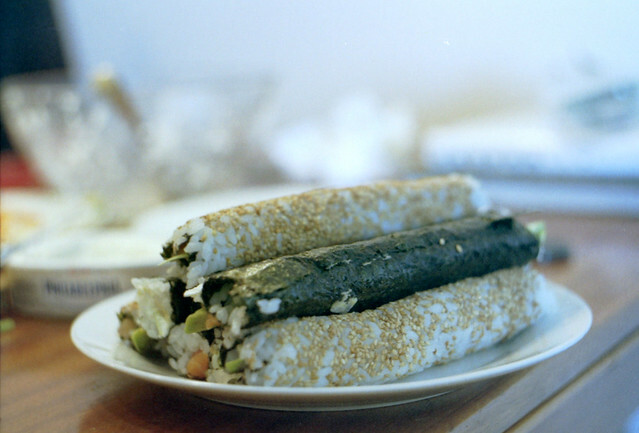 Temo que ahora TENGO que ir por algo de sushi para cenar... ¡Eres un chico super creativo! Saludos desde el caluroso México. Hello again (if you haven't already, check out comments on previous post) - I was surprised to see the shape of the children's pillows (what country was that photo taken in?) and then yours. In the pictures I saw online the pillows were round and fairly flat, like a cookie, not plump and the shape of a fat, juicy sausage. Interesting. Fascinating to me how you made your pillow and the contents of it. Makes sense, but would have never guessed. On to the pins - how do you "load" the thread onto the bobbins (by hand?) and are you told how long each strand should be? I can pretty much figure out that the number needed is determined by the pattern you choose, but keeping them from tangling all up, oh my. 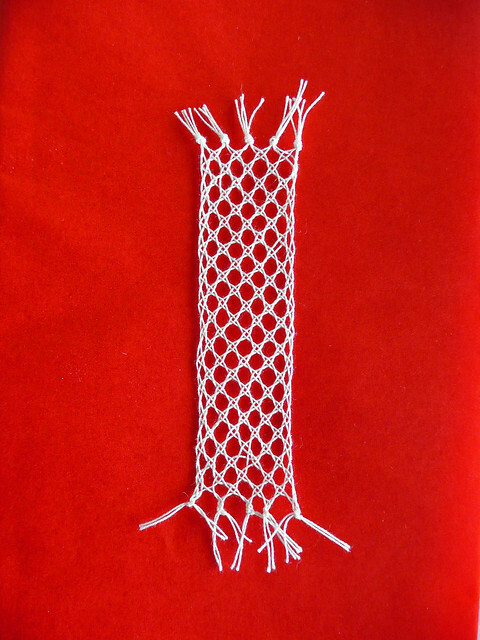 I think my bobbin lace pieces would become known as "The knots of bobbin lace." :-) Your first piece is quite impressive, actually, but you challenged me when you said there were two mistakes. Had to find them, and think I did, and noticed you didn't include them in your close-up photo. :-) It's amazing, is what it is, but I am still wondering about your mental state. Jet lag, maybe? I"m anxious to see your finished lopapeysa. I know I'm going to like it. You're right, that is a funny camera and it will be fun to see how the pictures look. 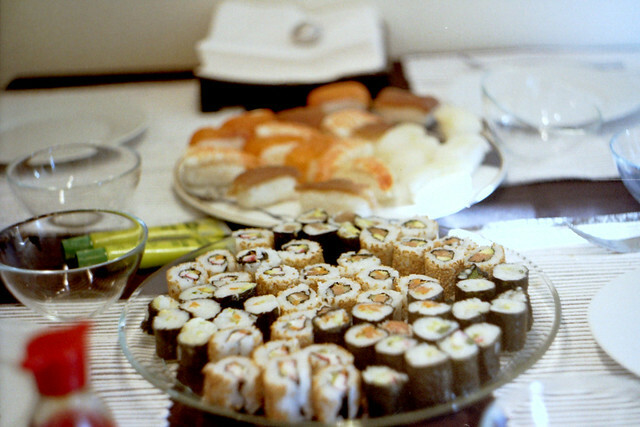 Sushi - um, no thank you. I tried it once, but really didn't care for it, so I leave it for others to enjoy. Does look like a lot of work, but I make other things that take a lot of work, so can't say anything about that. If you really like it, it's worth it. 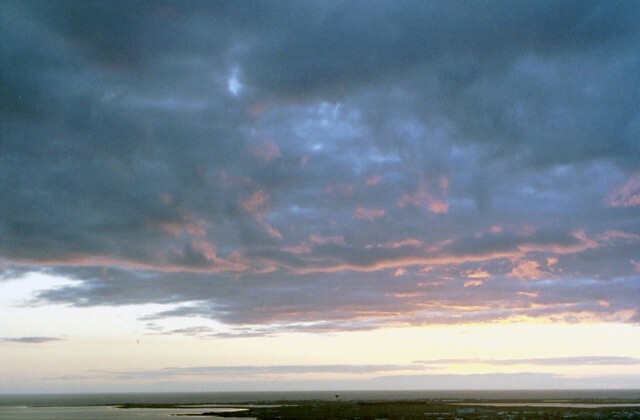 As usual, you have a beautiful sky photo to share. Couldn't believe the hour it was taken. I'd have such a hard time going to bed at night, but I guess exhaustion would eventually win out. Bet it's hard for mothers of small children to convince them that it's time for bed! Hope your weekend ahead is filled with lots of beautiful scenes! Kristín: Takk fyrir :) Ég er mjög ánægður með þetta. Veistu hvað þetta heitir á íslensku? 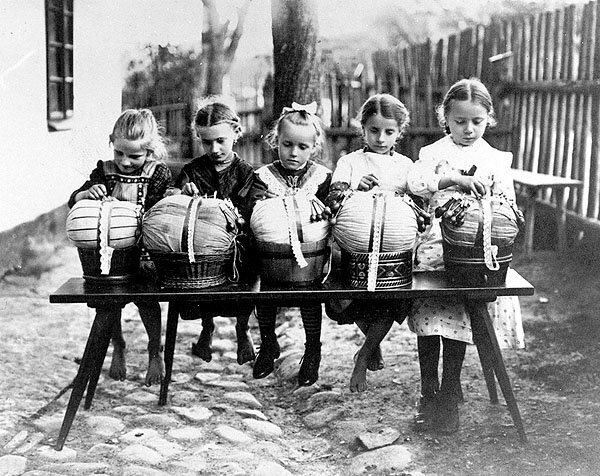 Jóhanna: Bobbin lace is wonderful but I think that once you learn it is not so time consuming. Have you seen videos in youtube of people doing it? They are so quick! It is amazing! 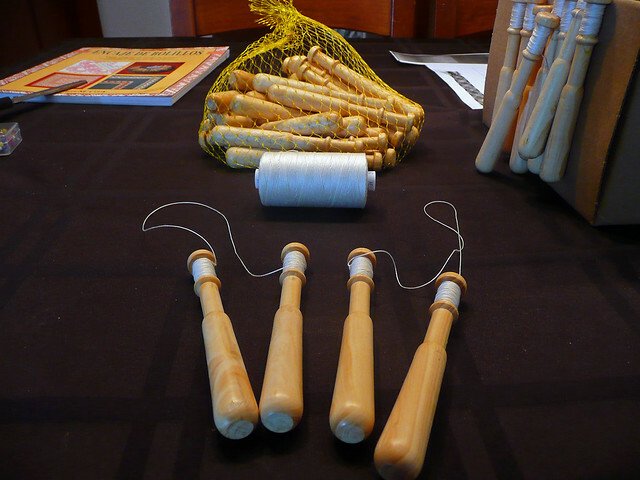 The bobbins are threaded by hand. It is not difficult at all. When you finish loading them you make a double loop to secure the thread so it won't run out of the bobbin (but it runs whenever you need more thread just by rotating the bobbin... it is pretty cool). About how much thread: I really have no idea. I just put about 2m of thread in each of them and I was hoping to have enough because I still have no idea what to do if I run out of thread or if it accidentally breaks. For this tiny piece 2m was way to much... I used a very little amount of thread in it. My mental status... humm... excited. I don't know if that can be considered as a mental status... but that is what I am now. This think has me really excited. Can't wait to learn more! It is strange to go to bed with so much light. I remember my first summer here was terrible. I could barely sleep. I even had to put black bags on the windows. Now it is not a problem. I even have white curtains in the room! hehe. What I always find funny is going to the theater, cinema or a concert late in the evening and go out of the the place and it is still so bright and even the sun is still up! It is very funny. La bolillera de Ikea se ve increíble... de hecho durante el fin de semana me fui a dar un paseo por Ikea y encontré la mesa Dave. Pero por ahora voy a seguir usando la almohada que acabo de hacer para aprender los puntos básicos. Sería súper guay que me pusieras en contacto con bolilleras espanolas! Seguro que voy a necesitar mucha ayuda! Mira que me estoy embarcando en esto de aprender bolillos sólo con la ayuda de un par de libros así que seguro que tendré MUCHAS dudas en el camino! Muchos saludos para ti también!